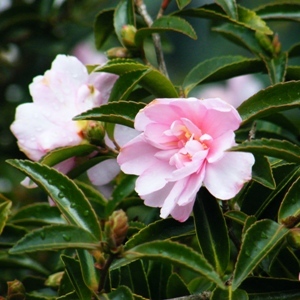 Most camellias flowering before Christmas are from the species Camellia sasanqua. Camellia sasanqua ‘Otome-Sazanka’’ (Pink Pearl) has medium to large, light pink, peony form flowers, veined darker pink, with paler margins. Growth is vigorous, upright and well-spaced, with dark green leaves. Ideally it requires a free-draining, acidic soil with plenty of organic matter worked into it, protected from easterly winds and exposure to early morning sun. The early flowers of this species make the blooms more vulnerable to frost damamge than the cultivars developed from the later flowering Camellia japonica. careful placing to protect the plant from early morning sun should limit frost damage. In a sheltered courtyard or shrubery the pre-Christmas flowers are sure to please you as the dark winter days still shorten.